Unilever brands such as Marmite and Ben & Jerry's are no longer available on Tesco's website, after a row over price increases. Unilever wants to offset the plunging value of the pound by raising prices across its products. This is to counteract the increased cost of importing commodities, with Unilever trying to put up prices for all supermarkets, including Sainsbury's, Asda and Morrisons, according to reports. 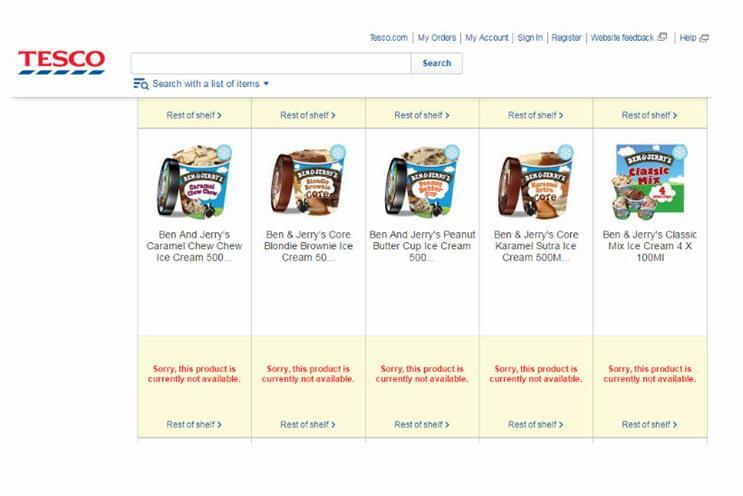 Tesco is the only retailer to delist products online, though some Unilever brands remain available in-store. The move is a direct result of the UK's decision to quit the European Union, with the value of the pound plummeting in the weeks after the referendum. Unilever's chief executive Paul Potts had warned in June that food prices would rise if the UK voted Brexit. Tesco's chief executive, Dave Lewis, was previously president of personal care at Unilever, earning the nickname "Drastic Dave" during his time there. He has previously suggested an improving relationship with Tesco's key suppliers. He told a Marketing Society audience last year that he had spent "a lot of time" with Tesco's top 60 and smallest 60 suppliers "to get a sense" of how they worked with the retailer. It appears other retailers are mulling whether to axe Unilever products. "What’s really a problem is when a supplier like Unilever comes and asks for across the board cost increases and there's no negotiation, there's no discussion. That’s been the approach that's upset the grocers," one anonymous source told Reuters, saying no decision had been made whether to accept Unilever's demand or delist some products.